See what our clients are saying. We've worked with some of the best interior designers in the industry. My home would be bland if it wasn’t for Willow Bloom. I started with a blank canvas last year and wanted to spice things up a bit and redecorate. I couldn’t decide on what direction I wanted to take my rooms in. Then I came across Willow Bloom. Their collections gave me plenty of inspiration to get started. Their pieces looked like they belonged on HGTV. I ended up buying a few myself to add to my home! They are lovely and help tie everything together! I owe my entire redecoration to them! Willow Bloom has decked out my house! They have been the only place I go to for cute curtains and pillows. Anything to make the room cozy- I know Willow Bloom will have it. I am always checking their website for new items to add to my collection. Their high quality pieces make the best addition to my living room and bedroom. And my daughter just loves getting to decorate her room with some of the things I buy from here. What a great store! I love it! I love the fact that everything at Willow Bloom is handmade. It makes the final product that much more special and one-of-a-kind. Their selection is hard to choose from because all the patterns and fabrics are super cute. 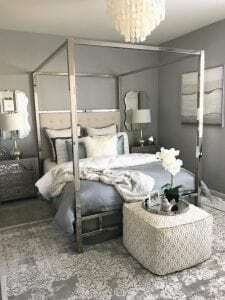 I love that they have multiple collections with items that go together or you can mix and match and pair them with your own furniture. I think Willow Bloom is 10 times better than the curtains and pillows you find anywhere because of all the customizable options they offer. Willow Bloom has great pieces that are so on-trend, they look like they belong in a designer show room! They make wonderful additions to any home and look like a million bucks. The pieces are so versatile! They go great in any room. Willow Bloom has so many soft items like curtains, ottomans, and pillows. They help you make such a cozy environment. And their great prices are hard to resist! You can redo your entire home without going over budget. You definitely need to check out their stock and custom items! I decked out my entire living room with pieces from Willow Bloom. 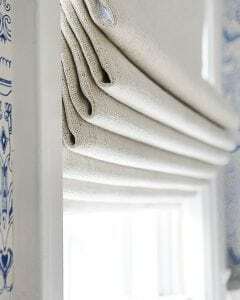 It started with these beautiful curtains I just happened across here but then I fell in love with its matching items. Before I knew it, I was loading my shopping cart up with pillows and ottomans and so much more. Their pieces are crafted to go together so well and they go with a variety of furniture as well. Versatile pieces like this are so hard to come by. I’m glad I found Willow Bloom! Great prices and great products! I love everything about Willow Bloom. Their curtains and pillows are to die for and they all come within my budget. It sure beats shopping at these outrageously expensive retail outlets! Everything is high quality and not cheap looking at all. I think all of their items are super trendy and will go with most people’s homes. I have loaded up on their items for all seasons and I don’t regret a single penny spent! I love Willow Bloom and all their products! Willow Bloom has everything you need to give your home a makeover. They offer curtains, pillows, ottomans and so much more. They have such a wide variety of fabrics and patterns available that you will have a hard time choosing the perfect one for you. Everything I have ordered from here has been exactly as advertised. The patterns are true to form, the fabric is high quality, and they get to my house pretty quickly. I love shopping with them. I am never disappointed in my purchase and everything goes so nicely together. Willow Bloom has such beautiful pieces. Their collections are very unique and chic and the materials they use are out of this world! I have found dozens of pieces on this website that I didn’t know I was missing. I have been happy with every purchase I made. Their items make my home look complete and I wouldn’t have it any other way! They are definitely worth a browse. If you have a hard time picking out décor items for your home, Willow Bloom is the place for you because it has something for everybody! I haven’t found a custom curtain company as good as Willow Bloom. Every time I have worked with them has been a delight. I am an interior designer and sometimes I come across homes with crazy shaped and sized windows, so it is good to have a go-to custom curtain company. They have met every crazy request of mind with an open mind and always create a one-of-a-kind product. I recommend them to all my clients and I have never had one come back to me and said they were disappointed with their curtains. I love Willow Bloom! I was looking for something specific for my new home and had a hard time finding anything. Then I found Willow Bloom. They have a wonderful selection of curtains and a wide variety available. Even better, they were able to custom make my curtains to my requests! Now I have exactly what I wanted and my home has never looked better. Everyone I worked with was very nice and helpful and my curtains came were shipped sooner than I expected. I will be ordering from them again! "One of the Best Investments We've Made"
We ordered custom cordless, blackout Roman shades for our daughter’s nursery and could not be more pleased! Willow Bloom exceeded our expectations every step of the way. From assisting with placing the custom order, to helping with installation questions (they even did a FaceTime call!) to the beautiful shades themselves. The natural linen blend fabric is absolutely stunning in person, and the cordless design feature is so easy to use, not to mention kid-safe. They are incredibly high end looking—We love them! I’d even go so far as to say they’re one of the best investments we’ve made in our daughter’s room in terms of fostering good sleep habits (blackout feature) and safety (cordless design) as she grows. Highly recommend Willow Bloom! Highly Recommend! 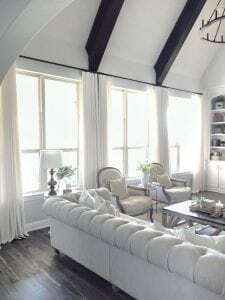 Recently redid our great room and ordered custom curtains from Willow Bloom. The curtains came out so nicely done and the fabric high quality. They answered all my questions and helped me place my order to make sure I was fully satisfied. Now to order matching pillows! "Couldn’t Have Found a More Perfect Ottoman"
I couldn’t have found a more perfect ottoman for my guest room remodel! I chose the “cable natural” fabric for my ottoman and I am so in love with it! The quality of this product is amazing and shipping was very fast! I’m very happy I found Willow Bloom. Will definitely be ordering again soon for upcoming projects! "Fabric is Such High Quality"
I'm so happy with my new curtains from Willow Bloom! They are so well made and the fabric is such high quality. I've been getting tons of compliments on them! They were very helpful in answering all my questions to ensure my curtains would be just right! Would highly recommend to anyone in the market for window coverings! I recently received two of the cream velvet panels and couldn’t be happier. Extremely well made and and love the weight of the velvet! Perfect for the cooler months!! I went with the privacy lining and 75”wide by 96” long. They give my dining room a custom look without the custom price! Highly recommended! !